Look, everything returns, even the signs on the walls. The crypt of Siena cathedral, where I found this design etched into one of the walls, was originally used by travellers on the via Francigena. It was the place where pilgrims ate, rested and purified themselves in preparation for their devotions in the cathedral proper. Sometime in the 1300's this crypt was filled to its roof with debris, closed-up and forgotten about, only being rediscovered and restored in 1999. Dotted among the remarkably well preserved and brilliantly coloured murals of the crypt, graffiti-like inscriptions can be found, one of these in particular intrigued me. At first sight the interwoven, interlocking design of this symbol reminded me of a Celtic pattern, but it was clearly not a Celtic cross. So what was it? Back home again after my holiday I began doing some research to see if I could unlock this mystery and was delighted when I discovered a recently published book* on medieval graffiti which had an almost identical symbol on its front cover. Based primarily on research carried out in churches and cathedrals of England (particularly in Norfolk and Suffolk) not only does this book give a fascinating insight into parish life of the Middle Ages it also transformed my understanding of the role which graffiti played in churches during medieval times. It was not regarded as we would see it today as random or destructive. On the contrary, graffiti had both meaning and function and it was tolerated and respected by church authorities. In some cases the inscriptions were devotional, in others, votive. Some of them were marks left by guild members or stone masons. In other cases they represented charms, curses or ritual protection marks. Whatever their meaning, they were accepted and acceptable expressions of the life and faith of the local community and, as such, they had as much business being on church walls as did the more officially sanctioned frescos and murals. 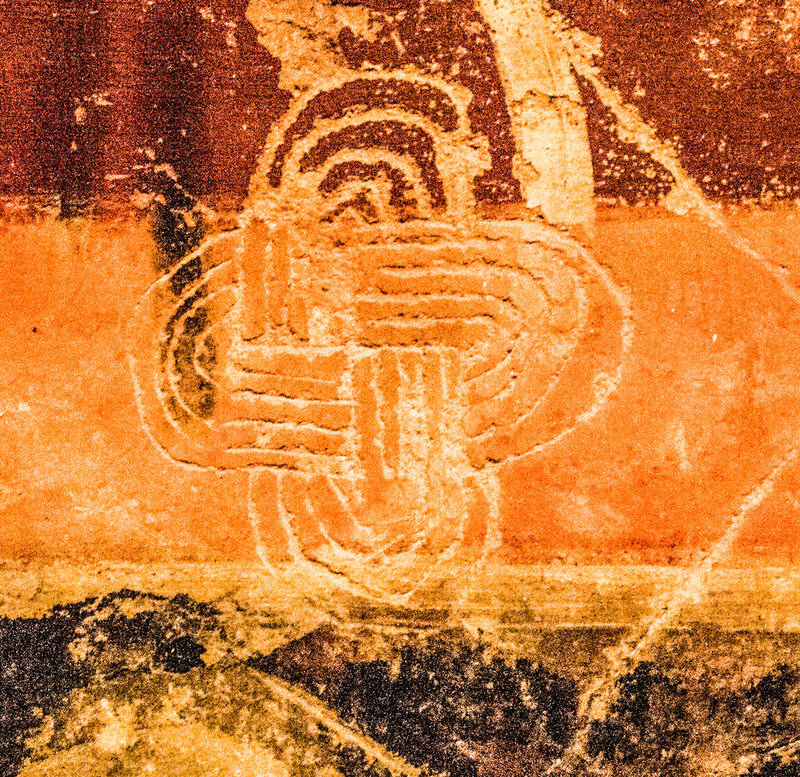 So, the mystery of the sign has been solved, my initial curiosity has been satisfied but questions continue to multiply: How long did it take to make this endless knot and who was the pilgrim who engraved it? How far had already been travelled on the pilgimage, I wondered? Was the longed-for destination reached, and was the hoped-for protection from evil received? The answers to these questions I shall never know. Whatever else was intended, this sign was meant to be seen, and it was meant to remain visible for a long time. So I know at least that one of the pilgrim's hopes has been realized. Whoever etched it could never in their wildest dreams have imagined that their work, like some of the art work that decorated the walls of the great cathedral above the crypt, would still be there to be noticed and admired by another traveller from a very different world, some 700 years after its creation. Somewhere in the south of France the village graveyard is still. Sunlight blazes, ricocheting off the white marble slabs. Cicada song swells and pulses, shredding the parched air. Mine are the only footsteps, all other sensible life-forms are sleeping in shadows. Sweat trickles from my forehead into my eyes. Stupid, I think, to have come out without a sun hat. Two birds arrive and fly close making a strange clicking sound. Is this their normal call or an alarm call? Are they accompanying me or leading me? Perhaps they have a nest with young near by and are trying to distract me? Lulled by the heat, I let the birds lead, and I enjoy following, not having to frame a thought, letting the mood of the moment permeate. The birds eventually fly away, but they have led me in. Now there is only effortless following and quiet attention; now there is only deep contentment, self-forgetting and a sense that something is offered here, something unfolding, like fragrance. Can I immerse myself? Can I let myself be immersed? Let's see. There's no construction; no plan. Let the suggestion play. Yes.... I'll come back to this place tomorrow with my camera. The first thing I notice when I enter through the cemetery gates at 8 o'clock this morning is a small white dog sitting on the path ahead, his fur edge-lit by the sun. We seem to be alone, yet his lead is tied to a railing, so there must be an owner somewhere. While I'm watching the dog, enjoying the gentle light and the freshness of the day I hear a voice and then a woman carrying a watering can suddenly emerges from behind one of the tombs. She looks to be in her 70's; she's wearing a bright orange crochet top with beige trousers. Thin strands of unwashed hair trail around her shoulders. When she speaks it's evident that she's missing several teeth. Her words are unclear and her phrases haphazard. She makes random connections and my French isn’t up to following her unexpected side-turnings and sudden switches, but I feel she's part of the invitation of this place and I really want to understand her. Trying to make simple conversation I indicate the dog waiting patiently in the shade. Yes, he is hers. “Do you come here every day?” I ask. She eyes me suspiciously. “Why do you ask me that?” I was just trying to be friendly. I didn't mean to scare her. I scrape together a few more French words and try again: “Are you the care-taker here?” No, apparently she just comes to water the flowers for some families. “May I take your picture?” It’s the first time I’ve dared ask this of a stranger. At first she hesitates and says she’s not looking so good but I reassure her and after a little encouragement she agrees and leads me to the tomb she wants to stand beside for the photo. After finishing her watering she tells me she's leaving now. She goes to collect her dog then comes and kisses me on both cheeks. I suppose I didn’t frighten her then. I'm very relieved. At first there's no sign of the flower-waterer this morning so I start by photographing some fern leaves and a basking lizard. Then I catch sight of her arriving through the gates. Today she's wearing a broad-rimmed white sun-hat and a smart black and white cotton dress. She tells me that she's going to meet two of her friends at the village café after watering. It's her turn to pay for the coffees. Off she goes again leaving me to follow cautiously in her wake wondering if I really want to see; if I really want to go where she's leading. Suddenly she stops and points to a photograph on one of the tombs. “Look!” The face is that of a young man, hardly more than a boy. “I found him last year”, she says. “...two o’clock one morning, walking my dog… lying beside his motorcycle… I don't know, perhaps he'd been drinking.” We stand staring at the photograph without speaking, but I sense the shock of her discovery still reverberating around us. It's shared now of course – the impact – taken out of time (his, hers, mine), it ripples through us, and we watch by the graveside until the waters are calm again. She has to go now, she doesn't want to keep her friends waiting. Where was I staying? Did I come to this part of France often? “No, not often. I'm on holiday. Can I take another photo of you?” She agrees without hesitation this time, straightens her hat and smiles. After she leaves a police-car arrives. Three agents fan out and begin searching the graveyard. I did a pretty extensive tour of the whole cemetery yesterday and saw nothing out of the ordinary. It gets me thinking though. I suppose a cemetery would be a good place to hide something if you wanted to. A body, for example. I've always felt comfortable, almost at home, in graveyards. The possibility that I might stumble across something sinister… something actually dead, had never before occurred to me. After a quick search, the police, apparently satisfied get into their car and drive-off. I'm at the cemetery by 7am today, the air is filled with birdsong, the breeze already warm. After walking around with my camera for about an hour studying the deep grooves of the cypress tree bark, the algae, moss and lichens on the headstones I come across a tomb I hadn't noticed before. I move closer to get a better look because at first I can hardly believe what I see. It appears to be a photo of a young woman holding a camera. I've never seen an image like this on any gravestone before. She's sitting in her studio; the camera, on a tripod in front of her, is pointing towards me. She's smiling out at me and for a second I'm unsure who is the seer and who the seen. For a moment the eye of the camera bridges us and life flows over - overflows. It's as if I'm seeing another version of myself looking back at me, engaging. There's no time or space here… but the bridge is alive. Then I hear scratching which I first take to be a bird in one of the cypress branches. Then I see two red squirrels chasing each other around the trunk of a nearby tree. I wait and watch; soon all is quiet again. They have moved on up the tree. I move closer hoping they may come back. After about five minutes one of the squirrels appears again. We look at each other and as I raise my camera he runs around the other side of the tree and peers out at me from behind the trunk. I have him in focus now. He poses for a couple of seconds to let me get a few shots of his good side and then darts off again. While I'm standing reviewing the images I've just taken, a cypress cone hits the ground near my feet. Did it fall, or was it thrown? I look up into the branches and see nothing, but sense I am being watched. I turn back to the camera again. Then I hear some more scratching and another cone falls. Incredibly, they seem to be signalling to me; they seem to want to play! While I adjust the settings on the camera and get ready for some more action one of the squirrels comes all the way down the tree and leaps onto a nearby grave. Then the second squirrel comes running straight towards me. By this time my heart is pounding. I'm desperately trying to keep the squirrel in focus while remaining as still as possible hardly daring to breathe. She stops just a couple of feet away from me, waits for a second, looks up into my eyes, then both squirrels fly back up the tree leaving me standing alone in the sunlight. The words come out so fast then that I'm not able to piece the story together at first, but gradually I gather that it was an incurable illness. She was taken to Paris because she wanted to donate her organs. “She gave her heart. She gave everything.” says the flower-waterer. We walk back to the tap together in silence, contemplating the enormity of this gift. I explain that I shall be leaving in two days and that I’d like to have her address so I can send her some photos. I find a piece of paper and pen and begin to write: “Madame…?” “No, Madame is not necessary” she says. I ask her to spell her name. Can she write it for me? She hesitates, then rummages in her bag, finds an envelope, tears off the front and hands me the scrap of paper with her address on it. I thank her and tell her it has been a pleasure to get to know her. As we part I kiss her on both cheeks and promise I will write to her soon. “Yes,” she says sadly: “telephoning is expensive isn't it?” It's only as she's walking away that it occurs to me that perhaps she's unable to read or write. I do realize that spending so much time in a graveyard is not everyone's idea of a fun holiday. Most people wouldn't come to a graveyard for pleasure. But I also know that something profound has taken place here; something which reaches far beyond the seeming events of these days. The key is receptivity; the willingness to accept the invitation into stillness – that stillness which is at the centre of all movement – and become immersed in it. Stillness is not death; on the contrary, it is a quality of presence, pure and alive. In fact it's perhaps only in the heart of stillness that life truly lets itself be known and delighted in. This, for me, is the gift of the graveyard; where no one is rushing; where squirrels play, flowers get watered and the air sings. Flying at 35,000 feet over Bhagdad, I lift the window shade and gaze out into the night sky. A crescent moon lies on its back with one star in attendance, ahead I can just make out a faint red glow on the horizon. I am en route for India - the land of seeing and the land of seers – heading off into a new day. It was in 2001 that I first came into contact with Sri Ramakrishna. It’s hard to believe now that I knew nothing of him before that day a little over ten years ago when I happened to pick up a copy of the book They Lived with God and first began to feel the pull of a very great soul. At first there was much about Hindu devotional practice and Vedanta philosophy which was unfamiliar, but there was no denying that whenever I turned my mind in Sri Ramakrishna’s direction I could feel a faint pulsing, as if sound waves were echoing in the cells of my body. The depth of this man’s self-surrender had clearly made such an impact on the world that the air was still ringing with the light and force of it. 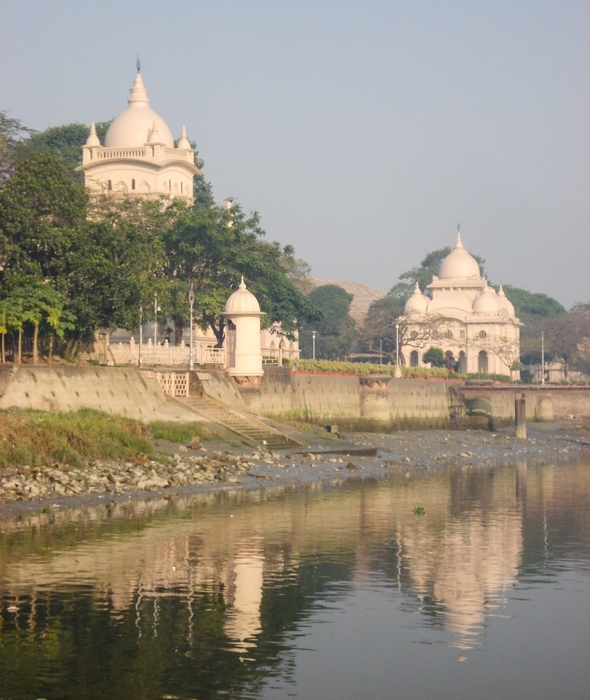 The more I read over the years, the more I thought I would one day like to visit the Dakshineswar Temple just north of Kolkata where Sri Ramakrishna had served as a priest, undergone his spiritual practices and taught his disciples, but I certainly had made no plans to make such a trip. In fact, the original impetus for this pilgrimage didn’t initially seem to come as a result of anything to do with him. I was watching a TV programme one evening about the wandering minstrels known as the Bauls of Bengal. The programme documented something of Baul philosophy and tantric practice. It also followed some Bauls on trains and busses as they sang their soul-stirring songs of love, joy and longing for union with the divine. I had no idea that anything unusual was taking place while I was watching, but after the programme I turned-off the TV and went to bed with a mind full of light. It was only then I realized that the programme had communicated something more than information but I had no idea what, so I decided to begin finding out more about Bauls the very next day. Baul life is unconventional, non-conformist, often misunderstood and ridiculed. Their music is palpable, their songs capable of disturbing, inspiring and drawing others like magnets. It became quickly apparent to me that the spirit of Baul life, as traditionally lived, has much in common with that of Sri Ramakrishna and that the inspiration which I had received through the TV programme was clearly part of that larger stream which had “hit” me all those years ago when I first began to read about Sri Ramakrishna. When I discovered that much Baul activity goes on in Bopul, West Bengal, an area not far from the Dakshineswar Temple complex, the desire to go there on pilgrimage quickly grew in me. Coincidentally, some money which I’d had in a 10-year savings account had just been released. It was clear what I had to do: in a matter of weeks I had booked the flight, got the visa, had the injections and was on my way. 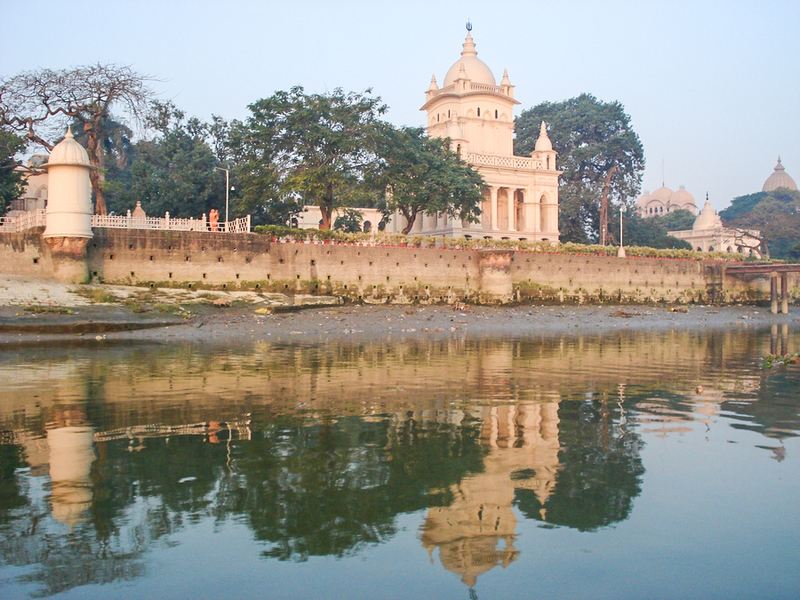 I knew that I wanted to visit the Dakshineswar Temple, the shrine of Mother Kali, and the room in which Sri Ramakrishna had lived and taught. But it had also become clear to me that this pilgrimage was about more than visiting specific places. What the TV programme had done was reawaken in me the poetry of the love song. My quest, like that of the Bauls, is to dive deep into the depths of the soul and discover the Moner manush or ‘person of the heart’ where the divine is enshrined. So when I go to the Belur monastery office on the day of my arrival and Naren Maharaj asks me if I’d like a list of places to visit connected with the life of Sri Ramakrishna, I am already clear that I have to resist the temptation to pack my days too full. The point of this pilgrimage is not so much about where I go or what I see; the point is to travel in Baul-spirit. Like walking; like breathing. Take the name of the Beloved into the heart. Allow for the unexpected. Appreciate all. Let the heart-song take over and see what happens! In preparation for the pilgrimage I’ve been reading Swami Vivekananda’s Inspired Talks, just one page per day, letting myself soak in the scope of his vision and the depth of his inspiration. So naturally, the first place I am drawn to after breakfast on my first full day at Belur Math, is Swamiji’s room. Walking through the temple grounds in the early morning my mind begins to quieten: Let go of your ideas. Take things as they come. Enjoy the scene of Mother’s Play as it arises. All is Her theatre: the theatre of anything can happen. Whatever comes, feel Her to be beautiful. Relinquish all thought and all questions; pray only to see the light of Her face everywhere. Climbing the steps up to Swamiji’s room I am accompanied only by the caw-cawing of the crows. Standing by his window, conscious of the sun rising behind me on the other side of the Ganges, gently warming my back, I peer into his room and let my eyes adjust to the darkness. These are the things he has touched: his turban, his walking stick, his shoes and musical instruments. They are so personal, these things. It is as if any moment me may open the door and walk in to fetch them. A thin beam of light shines into the room through a crack in the curtains and falls across a small wooden altar on the desk. This altar contains an image of Swamiji as a wandering monk. Someone has lovingly placed a rose on the altar and I watch as the sun slowly spreads its light across the petals at his feet. Becoming aware of some quiet footsteps behind me I watch out of the corner of my eye and see a swami coming to pay his respects. He kneels at the other window and prostrates himself on the ground. The movement is soundless; the simple, supple gesture of a body used to devotion. The swami leaves and I stand for a while alone again listening to the water of the Ganges lapping softly against its banks. Then I too kneel and touch my forehead to the ground. As I do so my heart swells and fills; tears begin to stream down my cheeks and a quiet resolution arises in me: 'Don’t be afraid to let your heart be seen'. There is no voice; just an inner knowing that this is why I have come. This is why I am here. Defences are dissolving, banks are crumbling and I let the tears flow as the Ganges flows, untroubled beside me. After sitting a while in meditation I get up and walk down the steps from Swamiji’s room towards the bank of the Ganges. I glance down into the water and there just a couple of meters from my feet I see a body floating. Still jet-lagged and culture shocked, I stand staring, trying to take it in. At first I think it is some kind of grotesque, life-size, blow-up doll; some sinister dummy. But the presence of the crows pecking at the face quickly tells me that this is real; a real human body. It is the body of a man, the brown skin has a grey pallor, the limbs, stomach and face are swollen. Then I notice that the body had been placed on a raft of Bel leaves and that some yellow flowers have been scattered. I realize this must be a kind of burial but it wasn’t immediately obvious because the leaf-raft is falling apart. The body, the leaves and the flowers are all parting company. Everything is quietly drifting, freely floating in its own fashion back to the ocean. Death has always appeared static to me before, in hospitals or funeral homes. I have never seen death floating like this, moving so fully in the mid-stream of life, and at the same time, so utterly detached from it. Walking along the river-bank, following the body as it floats down-stream, I see a group of young men ahead of me. They watch the body approach in silence for a few minutes, then they catch sight of some young women dressed in their finest saris for the Sri Sri Saraswati Puja later this morning. Their interest in the body – the dead body – evaporates. Further still along the bank some children have also noticed the body floating on its slowly disintegrating bed of leaves. At first they point excitedly and giggle: Ugh! After a while though they gradually fall silent and become serious. Then, noticing my approach, one by one the children shift their gaze. Their solemn eyes, so recently considering the corpse, now come to rest on me. Meanwhile, still trying to get a handle on this happening, my mind is rushing on. I’m thinking about the environment, about hygiene and disease, worrying about the people a little further downstream who are even now standing washing themselves in the river just a meter from where the body will shortly pass. But even as my mind spins-on in this fashion I see that it is useless. The body is simply passing me by, unconcerned, unimpeded by my thoughts. By now, crowds of people are arriving at the temple for the Puja. Conch shells are being blown, bells are being rung. The temple is resplendent, the atmosphere festive, but I walk quietly back to my room. I’ve already seen more than I can take in for one day. Some days later while waiting outside Naren Maharaj’s office a woman approaches me and introduces herself saying she is an English teacher organizing a school trip for her children. They are coming to visit the monastery on Thursday and then they are going to visit a local school where there is a chair once used by Swami Vivekananda when he attended a prize-giving. The woman says she’d love to “show” me to her children. Would I accompany them? I agree. On Thursday Dhira comes to pick me up for the school trip as promised. Grabbing me by the wrist, as if she’s afraid I might escape, she leads me to the front entrance of the Temple where the school bus is waiting. The children gather round me, excited to see a foreigner at such close quarters, some of them taking pictures. Once I’ve been introduced to all the staff we climb aboard the bus and set-off to visit the Chair. On the way, some of the girls are eager to recite some English nursery rhymes for me. The bus shudders and shakes; car horns honk; bicycle bells jangle. Twinkle, twinkle little star..... Music blares from radios; beggars clang their metal alms dishes. Jack and Jill went up the hill.... Sounds merge. Nursery rhymes blend in to the Great Cacophony of All. Undeterred, the children continue their recital, staggering and swaying around in the aisle as the bus bumps through the pot-holes and swings round the bends. At the school, the headmistress explains that it was in 1901, one year before he died, that Swamiji came here to give out prizes. He was already sick with diabetes, and had refused the invitation several times, but had eventually agreed when pleaded with. When we have all been upstairs in groups of 10 to pay our respects to the Chair, I teach the children a rhyme which I used to teach some of my English students and then, before we leave I tell them that some people in the international guest house where I’m staying have travelled half-way round the world to visit the temples in Belur Math and how lucky they are to live right here on the doorstep! The girls hadn’t seen things this way before. Newly aware of their privileged position in the world they look up at me with wide, sparkling eyes and when it’s time to go they won’t leave the classroom until they all have my autograph. Emerging from the school, we are awash with vitality, buoyed-up on a rush of energy which seems to radiate through us all. It’s as if we have all been immersed in one enormous feast and, as we wave our goodbye’s, I’m sure I’m not alone in feeling that Swamiji has enjoyed our visit to his Chair as hugely as we all did. At first I find it impossible to meditate in Sri Ramakrishna’s room at the Dakshineswar Temple because tears keep welling-up as if someone has left a tap running. So I just sit on the floor among a few other people and quietly take in the scene around me. High up on the walls surrounding the room are photographs of all the direct disciples. As I sit I remember their stories, calling to mind all those people who stepped over this threshold, as I’ve just done, to make acquaintance with a man who was to change the direction of their lives forever. People continue to enter the room, some of them sit to meditate, others stand for a while, some casually look around and walk out again. After a while a man dressed in a simple white cloth enters. Without looking around, he walks to the centre of the room, lifts his face towards the photographs of Sri Ramakrishna’s disciples, raises his arms, turns once – almost as a Dervish whirls – then steps out of the room, into the bright sunlight and is gone. The moment passes before I’ve had time to register what happened. Who was that man? Where did he come from? Where did he go? I had seen many imposing temples, grand shrines and striking images on this trip but nothing I had seen communicated so eloquently or described so gracefully what is, for me, the essence of Sri Ramakrishna’s life: utterly unselfconscious, spectacularly simple and so swift I could easily have missed it. Recalling the sudden appearance and dis-appearance of the man in Sri Ramakrishna’s room, the connections are immediately clear to me, but it’s not until the day after I return home as I’m standing in the kitchen making some coffee that I fully register the impact of what I saw. Whatever happened in that room in Dakshineswar, it is only here, now, in Amsterdam that the memory of that one Baul-like gesture flows as a current through my mind and I get the circle: the phenomenal reach of it. A pilgrimage leaves many impressions on the mind. Before setting out I had certain ideas about where I was going. When I returned I had ideas about where I’d been and what I’d brought back with me. Whatever my meanings and interpretations though, the actual experience – the pulse of the pilgrimage – can’t be described in these terms because it is not ‘mine’. As the body flows, as the Ganges flows, so the pilgrimage flows. The Kali-continuum is everywhere and nowhere: composing-decomposing-recomposing. The brilliant colours of the saris; the perfect petals of the rose; the solemn eyes of the children and the crows feeding on a rotting corpse… All points to the same divine conception: the inexorable rhythm of the heart-song, as intimate as it is immense. You probably haven’t heard of Zoe White, author of Book of the Heart: A Personal History of Seeing. She’s not been featured on Oprah’s SuperSoul Sunday. She hasn’t been speaking at any big-deal progressive Christian conferences. She doesn’t have a TED talk. And that’s a shame. I don’t know how all that stuff happens to people, but I wish it would happen to Zoe White. But I guess people who end up on SuperSoul Sunday, or speak at conferences, or get selected for a TED talk . . . those people have figured out how to concisely and clearly share a lesson they think people need to learn. White has something important to share with us, too, but it’s something that is really hard to put into words. It can’t be broken down into a compelling 20-minute video or interview, or even a 45-minute talk. And it doesn’t really fit into the category of a lesson she thinks people need to learn. It’s something else entirely, and I’m amazed she was able to make it so clear using only 136 pages of words. Zoe White has written a book-length illumination of contemplative spirituality. It’s not a book about getting somewhere. It’s not a book about figuring something out. It’s not a how-to book. It’s a book that simply illustrates the process of how practice and circumstance and relationship and thought all come together and create spiritual experience. It’s a book about mindfulness, contemplation, incarnation, and being. And it’s a beautifully written book about one human, Zoe White, and her curiosity about being alive. I read this book twice, something that is unusual for me. The first time I read it I just swam in the words and concepts and feeling of the book. I highlighted and highlighted because passage after passage said something that resonated with me, even though on the surface my experience has been very different from Whites’s. I read it the second time to try to get my arms around the book in a way that would enable me to write a “good review.” I thought it would be important to be able to relay what happened in Whites’s life, how the book was organized, and what important threads wove through the narrative. But I kept falling back, swimming in the words and concepts and feelings. I found even more to highlight. Finally, I decided the stories and structure and themes are not the most important thing about the book, and I could leave all that for you to discover when you read it . . . because you simply must read it. What makes this book special is how clearly it reveals the contemplative experience. Almost all of us walk around pretty deeply absorbed in the day-to-day events of our lives. Even our relationships with other beings tend to become a series of encounters, a series of events. These events that happen after we wake up each day are often blithely understood as the cause of the shifting comfort and discomfort that overlays our existence. But should events have that much influence over how we experience our lives? Maybe this incarnation doesn’t have to hinge on our involvement with events; maybe it can focus on the gently shifting meaning we create from our experience. Contemplatives of many different religious paths have claimed to find a type of comfort and satisfaction that blooms from being aware of something other than the events of their lives. Many historical contemplative figures stripped back their event experiences, isolating themselves or living very simple lives, intentionally limiting their exposure to the events that constantly assail and hypnotize the rest of us. Contemplatives seek to create (or perhaps a better word is “allow”) an experience of being that transcends the human tendency to become overly absorbed with events. Zoe White is intent on noticing. The subtitle states Book of the Heart is “a personal history of seeing.” While I can’t think of a better short phrase to describe what the book is about, the meaning of the word “seeing” did not initially conjure up the intended meaning for me. I didn’t understand what the author meant until I’d gotten well into the book. When White uses the word “seeing” she is actually referencing the concept I described in the paragraphs above—“seeing” means opening one’s eyes to the gently shifting experience of our lives that transcends our participation in events. What makes this book so extraordinary is that the author is not only humble and patient and curious enough to allow herself to explore what lies beyond and within the events of her life, but she is also articulate enough to allow us, her readers, the opportunity to witness this internal process. Knowing that it’s different for everyone, she doesn’t tell her readers how to see, she simply invites us into the story of her experience with seeing. Thus, we are given space and permission to explore it on our own. The lessons in this book don’t enter the reader’s consciousness through the eyes; they enter through the heart’s longing for connection with another’s experience. There are so many beautiful concepts expressed in this book that I must share a few, and hopefully whet your appetite for more. I’ve never heard prayer described this way or been aware that I have experienced prayer in this way, but now I want to. Now I want to find one of those gaps and dive in, just to feel what she is talking about. As I experience middle age, I’ve been digging into what this incarnation is to me. What I’ve done, what I wish I had done, and what I hope I might still get to do. White seems to have thought about the same concept and come up with a cogent expression of how it feels. White’s reflections resonate with the influence of her lifelong diversity of religious experience. Writing of suffering and how she learned to tolerate that most fundamental element of the human condition, I hear clear Buddhist tones. For those of us who are old enough to remember the world “before”—before computers, before the decline of objective truth, before 24/7 media demands on our attention, before everything changed—White’s words offer some hope. Of course Virginia was right. Book of the Heart is really special, and I can’t recommend it highly enough.